The Long-nosed Bandicoot (Perameles nasuta) pictured here was killed by a vehicle on the Whittlesea-Yea Road at Flowerdale in April and is unfortunately one of five known roadkill bandicoots in the past few months, mostly in the Stony Creek area towards Kinglake West. There is conjecture about the reasons for this spate of road deaths. Flowerdale farmer and naturalist Steve has been travelling along this road almost daily for 14 years, and, despite carefully monitoring roadkills (for possible young in pouch), had never seen a bandicoot until recently. One theory, looking on the positive side, is that, although disturbing to see these lovely animals being killed, it may indicate a large increase in the local bandicoot population following the catastrophic bushfires in the area in 2009. This may be as a result of the past two relatively wet years providing soft earth to dig in and a flush of insects and fungi, which constitute a large part of the bandicoot’s diet. Long-nosed bandicoots forage in leaf litter and often dig characteristic conical holes to locate invertebrates and underground-fruiting mychorrhizal fungi. The bandicoot also eats lush plant material and the prolific regrowth of vegetation after the fires provides both food and cover from predators. The night-time shots in the slide-show below were taken on remote cameras set up at Toolangi in April this year. 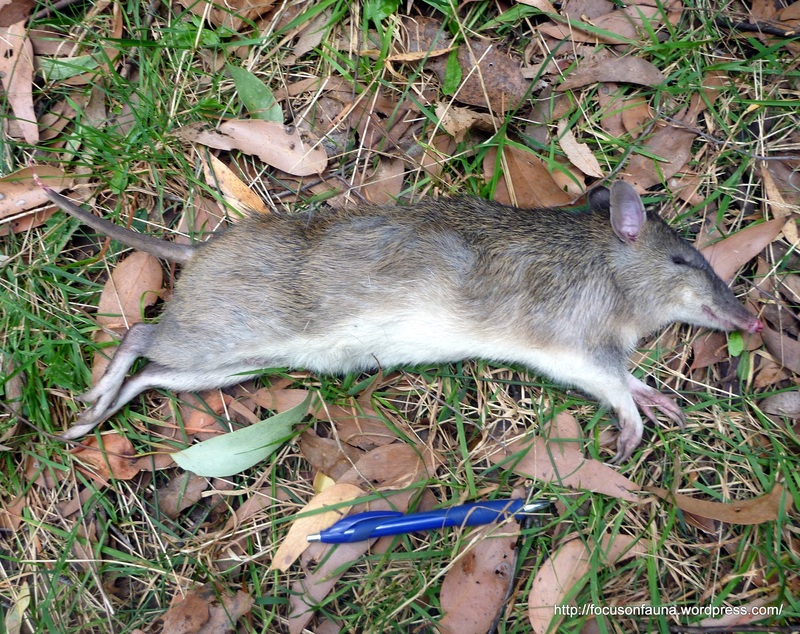 If you do see a bandicoot, alive or dead, please let us know, either by posting a comment or by emailing focusonfauna@gmail.com. While Long-nosed Bandicoots are not considered threatened, and have generally maintained their natural range since European settlement, degradation and fragmentation of habitat do pose concerns for their long-term survival. One factor in their favour is their high reproductive ability. They have a short gestation period of around 12 days, and females may mate again when the young are about 50 days old. Each litter consists of up to 4 young, and females can start breeding as early as 4 months old. Nests are well-concealed shallow holes in the ground; individual bandicoots may use several different nests. [Reference: Mammals of Victoria ed. Peter W. Menkhorst]. ← Focus on Fauna gets REAL! I reckon all the thick regeneration after the fires is also giving them good cover from predators and more young are surviving. Spotted what I believe was a Long-nosed bandicoot (based on the above picture) on Eucalyptus Road just now (10pm). It was drizzling rain and the little creature was hopping around right on the edge of the bitumen. It appeared to be catching moths. Have never seen one before despite 25 years on the hill. Hi Anne. That’s a good sighting, particularly your observation that it appeared to be catching moths. Can you describe a bit more precisely where the sighting was, either a distance along the road from a landmark or intersection, or a CFA map grid reference? That would be a great help in our mapping of the sightings of these elusive marsupials. Thanks for the sighting Anne. We have also had observations of the Long-nosed bandicoots from Flowerdale, Kinglake West, Kinglake (Mt Slide Rd), Castella and Toolangi. Another resident also mentioned to me about them eating moths on the road that had been hit by cars. Might also account for some of the roadkill. Bert, Eucalyptus Rd goes through the Kinglake National Park and follows Island Creek down to Glenburn.